Is there such a thing as a perfect suburb and if so, how is this utopia defined? Many would suggest an ideal suburb has affordable homes, great schools, low crime rates and a short commute. Others would like there to include educated neighbors, a strong appreciation for art and culture and entertaining things to do. Exceeding this criterion is the city of Edmond, Oklahoma. Situated in the heart of the state, the city is part of the Oklahoma City metropolitan area and has a population of approximately eighty-three thousand and growing. The city has experienced steady growth over the past decade and looks to continue this trend as media accolades reveal it's numerous wonderful qualities. Edmond, OK homes are heating up the market as the city veritably defines the term family-friendly; and considering a few facts it is plain to see how. The Federal Bureau of Investigation's statistics place Edmond as the ninth safest city of over seventy-five thousand in the nation and the safest in Oklahoma. Edmond Public Schools have an outstanding graduation rate of 99.7%. Perhaps this city's most important attribute and certainly a vital concern of most Americans is the unemployment rate which is at a hard to believe 3.5%. This number may be chalked up in part to the general attitude Oklahomans have toward hard work which is made clear with their state motto, Labor Omnia Vincit, labor conquers all things. 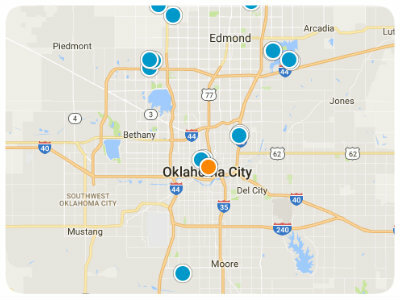 Edmond is only thirteen miles north of Oklahoma City and twenty-three miles from Tinker Air Force Base, making for an easy commute to the area's largest employers. Naturally, residential real estate in Edmond, Ok will include a whole host of styles and price ranges. Subdivisions are plentiful in this community and offer all the amenities home buyers desire most, such as clubhouses, swimming pools both indoor and outdoor, walking and jogging trails, fitness facilities and expanses of greenbelts. There are a number of gated neighborhoods to afford residents safety, peace of mind and minimal traffic noise. 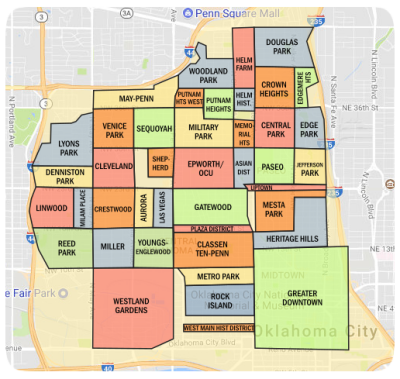 While many master-planned communities are complete with their own recreational areas, there are also twenty-six public parks throughout Edmond with playgrounds and fishing ponds, ball fields, sports courts and pavilions. Also maintained by the city is the Pelican Bay Aquatic Center, featuring a climbing wall, channel current, a swirling vortex, waterslides and cabanas. Offering unique shopping and entertainment, the Festival Market Place has been revitalized by the city and features events like Libertyfest and the Arbor Day celebration. Golfing enthusiasts will enjoy the Kickingbird Golf Club, a public course where a number of events and tournaments are held. The true aficionado may consider joining the Oak Tree Country Club which has two championship quality courses for its members to utilize. In fact, some love Oak Tree and golfing so much they'll choose to acquire an estate on the property. Beautiful Arcadia Lake, in the southeast portion of the city is extremely popular. The man-made lake has twenty-six miles of shoreline with facilities for picnicking, camping, swimming and boating. The fishing pier and covered, heated dock allow for year round enjoyment. The lake serves as flood control for the Deep Fork River Basin, also supplying water to the city. When it comes to arts and culture the city has a unique way of expressing itself. The downtown area is absolutely teeming with sculpture of all types, creating an environment which is both whimsical and fascinating. Residents have long understood that their bedroom community is a dream; smart, well-maintained and fun. Visit Edmond and take a peek at what may just be as close to perfect as a suburb can get.